Dathomir and Taris Free Space is a Star Wars Sim comprised of three locations in one, with differing rules for each. Please be aware of the differences. Dathomir involves the surface to the West, up to 1300 Meters. Taris UnderCity includes the Eastern half up to 1300 Meters, and Free Space ranges across the entire Sim from 1300 Meters to 1900 Meters high. The Free Space area is devoted to starships and space combat, not necessarily Star Wars in origin, and includes a space station with hangar facilities and rentals. Taris is a Roleplay area featuring the Ruins of Taris, many years after KOTOR. 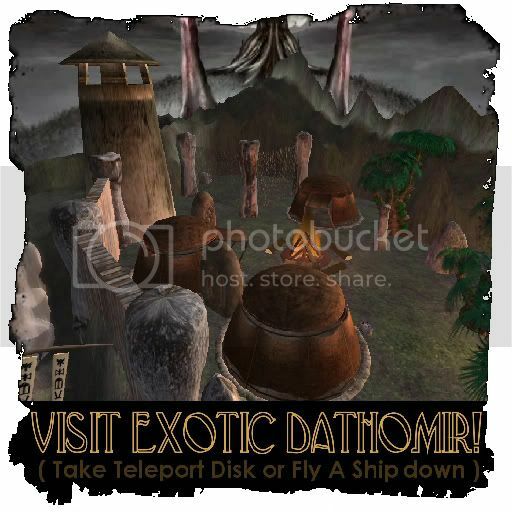 Dathomir is a Roleplay area featuring the planet's surface and a variety of moons and asteroids. It is the home of the famous rancors, Night Sisters and Witches of Dathomir. The Shuttleport. Carved into a sheer cliff face, the shuttleport is used primarily for shipments to the Jedi or the Witches if they are friendly. Occasionally wealthy big game hunters and those seeking to lie low pass through its cantina. Aurillia, the Jedi Village. At the end of the path to the shuttleport, flanked by henge gates lies Aurillia. Here the jedi have carved out a little bit of beauty and perhaps peace amidst the harsh mountainous wildernesses. The Night Sisters Stronghold rests hidden near a high area to the north, its watch towers surveying much of the surrounding area with a prison and cave complex under their control. The Witches Camp. High atop a bluff overlooking the seas and swamps, there is a small forest nearby limiting the size of ships able to land there. The Crossroads. Between the Jedi Village, Lowlands, Witches and Night Sisters are a tangle of valleys and box canyons, open spaces and foggy dead ends. Easy to lose your way in, especially if youre being chased. 1) Taris Free Space is at a very high elevation: always wear your Flight Feather (unless you'd enjoy a good fall )! If you are not in a ship, be sure you are flying before stepping off of any platform! Free Flight Feather dispensers are available throughout the sim. 2) Taris Free Space is best experienced with your draw distance set to maximum (Edit>Preferences>Graphics (check custom)>Draw Distance=512). Be sure to lower it again when you leave! 3) Use the region default environmental settings (keeps it nice and dark). 4) You may use any mutually-agreed upon RP system, or none at all if you just wish to fly around. All we ask is that you show each other respect. Flying isn't always easy, so please leave quick tempers outside — accidents will happen. If you do run into trouble (griefers and the like) please send Bith Wierwight or Daria Blackadder a note. While this is a Star Wars-themed sim, if you are not in RP you may fly any ship you choose, and dress in any fashion. Anyone not wearing an RP system should be assumed to be OOC and should be allowed "to go about their business." Please try to avoid flying into the platform areas. Please be aware that the Dathomir and Taris Undercity areas have their own rules, but if you are banned from either the Dathomir or Taris Free Space region, you are banned from the entire sim. Be a grown-up, please. 5) We will periodically have competitions (dogfighting, skill, etc.) and will also occasionally set aside time in the sim for practice-only sessions. 6) Check out the large platforms for shops and rental hangars. There will never be a charge to play here, but donations are always welcome. 7) To rez a ship, you must be a member of the Dathomir and Taris Free Space Group. Unauthorized builds/objects will be returned, and we are not liable for inventory loss resulting from returns. Leave stuff here at your own risk.